April fashion girl is here, and ready for any April showers that may come her way! April 2019 Calendar printable is here for your desktop desk or your desktop computer! Free printable or you can download and upload the April 2019 calendar printable to your digital desktop. The colors are bright because we know April is the month colors become alive again. But we also know that April means equal parts sunshine and rain. April girl has it right for what to wear in April showers. She’s got her rain boots on and rain jacket and a colorful umbrella to brighten up a grey day. You can complete your 2019 calendar collection by downloading March and February fashion girls. We have it formatted so you can cut the bottom half off and have a 3.5×5 print ready to be framed. March Girl is here! Get your Free Calendar Printable below. She is here, and she is just so sassy! March 2019 Calendar printable is here for your desktop desk or your desktop computer! Free printable or you can download and upload the March 2019 calendar printable to your digital desktop. We chose muted colors to get you excited for spring. March girl is a girl who is ready to take on her busy work day, while multi-tasking along the way. Because that’s what we are so good at–right ladies! Multitasking and staying up on all our responsibilities. March girl is confident, independent, and so well put together. She’s got fashion at her finger tips. She is passionate about life, her dog and the world around her. The March 2019 calendar printable is part of a new printable series this year. These FREE printable calendars come out the beginning of each month. You can print the 5×7 calendar out our download and use as your desktop wallpaper for your computer. Cut off the bottom at the end of the month and save the girl to frame or use as a postcard. Check out February 2019 calendar printable. Finally sharing my Chic Thanksgiving Table with all of you! Let me be honest with you. I pushed all the random house items off the dining room table (that still don’t have a place in the home) to the floor and quickly threw together this chic thanksgiving table that makes everything look elegant and totally put together. WRONG. What isn’t pictured is the mess of random house items in the corner of the dining room, an old bathroom sink and an old chandelier all taking up space in my dining room as we are currently doing some remodeling jobs in the house. Keeping it real, folk! Hope you aren’t in a mess like we are! Trying to stay happy and sane, and so thankfully to have a kind friend who has offered to let my family crash her Thanksgiving. But you know how I love throwing together a Thanksgiving table and sharing fun entertaining ideas. So I didn’t want to pass up this year just because there is a little dust in the house. Check out this chic Thanksgiving table and I have also included a FREE printable for the Thanksgiving menu and initial placement cards. All download below. For the chic Thanksgiving Table, I pulled out all my mercury vases and candle holders. Mercury home items can instantly make something look dull and boring to elegant. You can see how I decorated mercury vases with black and white plaid on this Thanksgiving table. Add color with fruit! I used oranges and lemons but could of also added pomegranate and grape to make it more of a farm to feast table. The floral arrangement is simply eucalyptus, craspedia, spider mums, baby flowers and I added natural wood floral stems to add texture. Our dining room is not quite put together. We are still working on it! Let me know what color I should paint our china hutch. It needs an update! Maybe a light gray or white or back to natural? 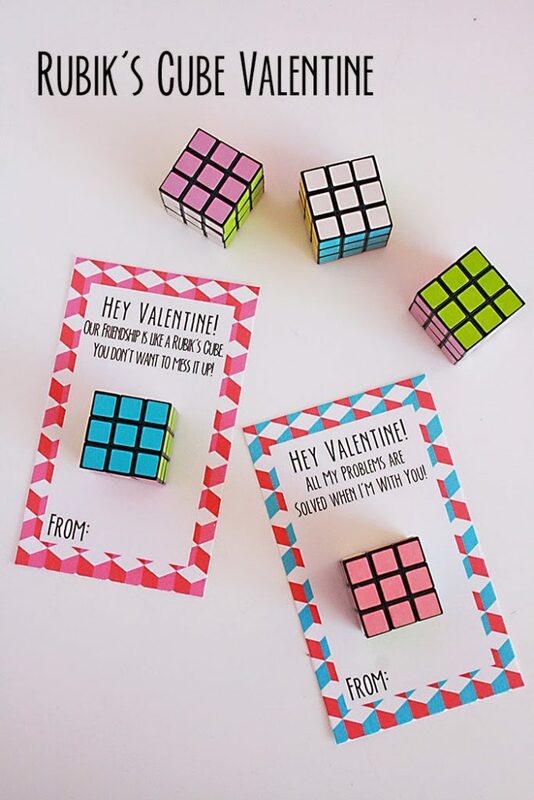 Rubiks Cube Valentines— Rubik’s cubes are so cool right now in 3rd grade. Every kid wants one. Every kid tries to solve one. And if you know how to solve the puzzle, you are totally on the popular list. 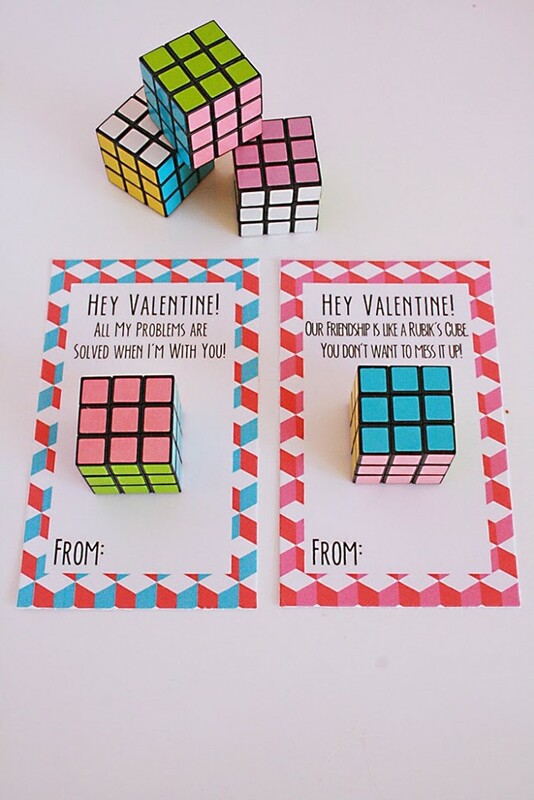 So, we know these are going to be a huge hit at the Valentine’s exchange party. I bought mini Rubik’s cube at Party City (or you can buy with the link). 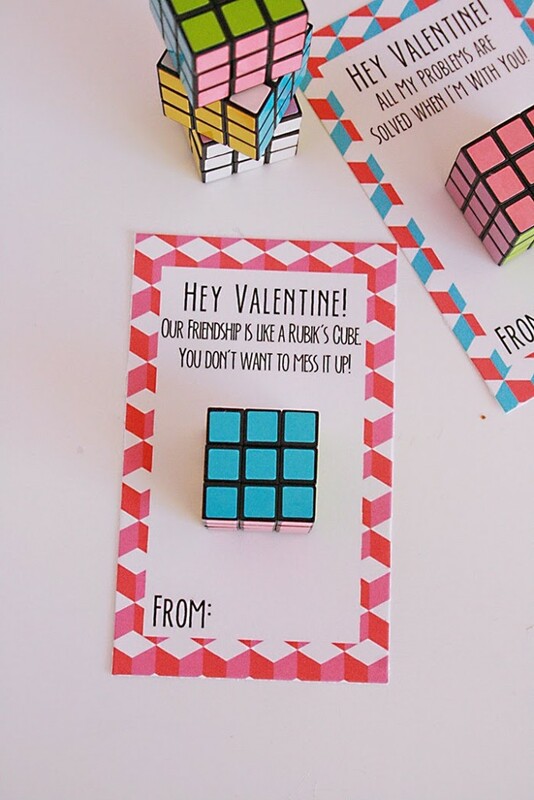 I did two printables for the Valentine: “Our friendship is like a Rubik’s cube. 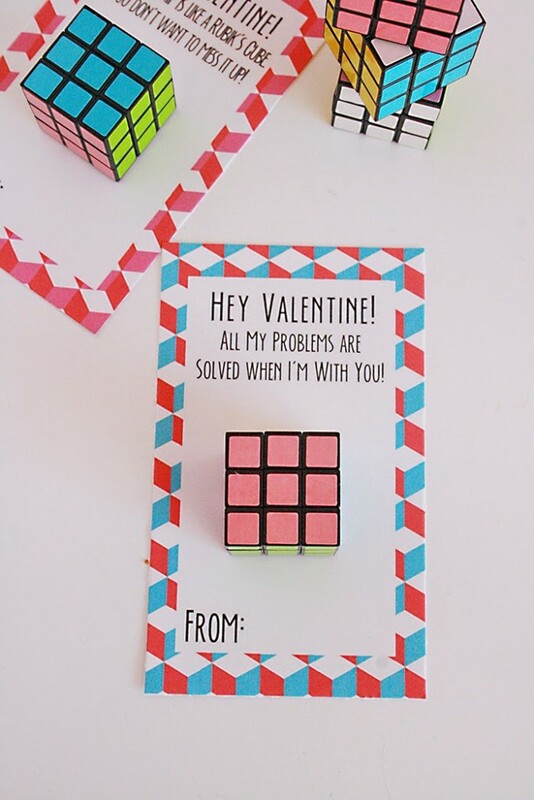 You don’t want to mess it up!” and the other is “All my problems are solved when I’m with you!” We just used tape to attach the cube to the print out. 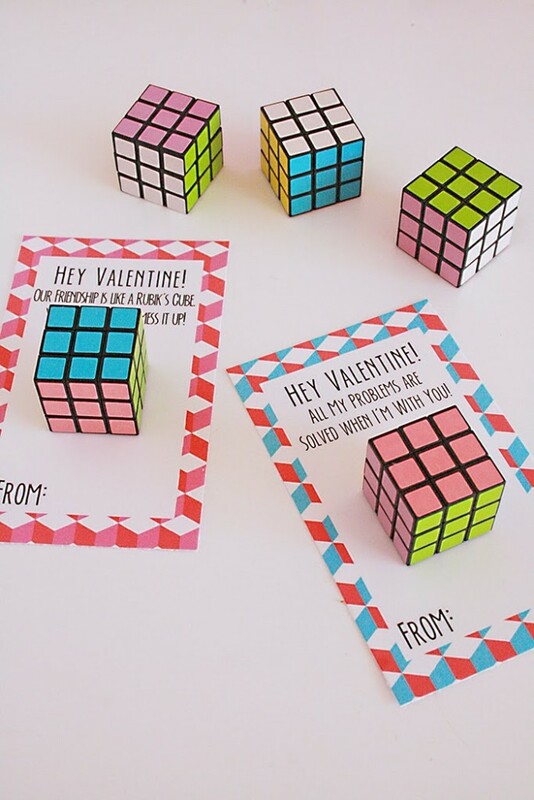 Attach a mini rubik’s cube to the valentines with a small glue dot.